1 of 4 In a medium-size bowl, mix flour, cocoa and salt. In a large bowl, beat butter and sugar until fluffy, 2 minutes. Beat in egg and mint extract. On low, beat in flour mixture in thirds, until dough forms. Shape into disk. Halve dough; wrap in plastic. Refrigerate 30 minutes or up to 2 hours. 2 of 4 Heat oven to 350 degrees F. Roll out dough to 1/4-inch thickness. Cut into 3-inch trees or 2-1/4-inch circles. Place on ungreased baking sheets. 3 of 4 Bake at 350 degrees F for 11 to 13 minutes or until lightly browned at edges. Transfer cookies to rack to cool. 4 of 4 In microwave-safe glass bowl, heat chocolate on high in 30-second increments, stirring until melted. Dip edges of trees into melted chocolate; let excess drip back into bowl. 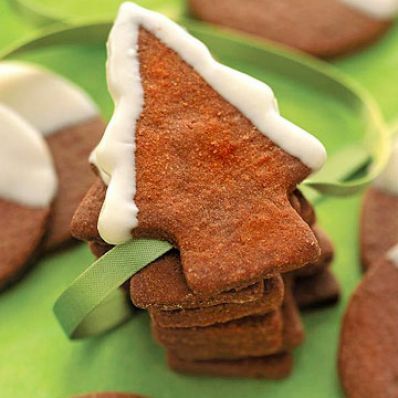 Dip round cookies into chocolate to coat half of each cookie. Place cookies on waxed paper; let dry. Store at room temperature up to 1 week. Makes 4 dozen cookies.